Now’s a good time to sell your home. Prices are on the rise. Snowbirds will be looking for a getaway soon. Lake Havasu real estate is primed and ready. Don’t make the same mistakes others have when it comes to pricing, though. What you think the sale price should be and what the market will actually allow could be very different. 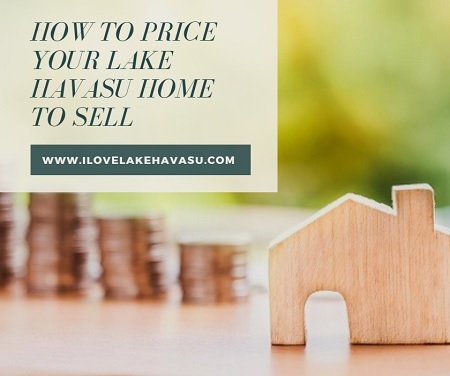 Learn how to price your Lake Havasu home to sell so you don’t spend months on the market. You’ve spent thousands of dollars upgrading appliances, replacing the pool pump, adding beautiful landscaping, etc. That doesn’t mean you’ll recoup all those costs when you sell your home. The first thing you need to do when pricing your Lake Havasu home to sell is to get rid of any “must have” number in your head. What do I mean? Let’s say you spent $200,000 on the purchase of your home originally. You’ve spent $15,000 over the years in upgrades, renovations, and replacements. Then, the property had to have appreciated in value over the time you were in it, right? So, you figure you absolutely must get $300,000 for it. However, the market says your home is worth $250,000. Guess what? The chances that a Buyer will pay $300,000 are highly unlikely. That means either you lower your expectations or risk sitting on the market for months, hoping a Buyer might come along and be willing to pay $50,000 more. Talk to your Lake Havasu REALTOR@. Ask them to pull the comps for all homes sold in your neighborhood in the last 30 to 60 days (the closer to 30, the better). Look for homes similar in size and amenities to yours. This will help you see what price your home should fetch on the current market. Also, discuss what market trends your REALTOR@ is seeing out there right now. Are Buyers specifically looking for something your home offers that others don’t? This could affect your list price as well. Studies show that overpricing your home up front could actually cost you money in the long run. The longer a home stays on the market, the more likely you are going to have to reduce your price to bring Buyers to your door. When a price gets reduced, Buyers are more inclined to put in an even lower offer because they think you may be more desperate to sell. After a few months and a couple of price drops, you may end up with a lower sale price than if you had simply listed it competitively to begin with. On the other hand, selling for slightly below market value could bring Buyers flocking to your doors. In turn, this may trigger a bidding war. That doesn’t always happen. But it is a possibility. My best piece of advice to determine how to price your Lake Havasu home to sell is to meet with your Lake Havasu REALTOR@. Their finger’s on the pulse of the current market. Use their knowledge to guide your pricing strategy. After all, that’s why you hired them, isn’t it?